Fred made his Off-Broadway debut in the original FORBIDDEN BROADWAY in 1982, continuing to play “Sondheim” in subsequent editions of the smash hit review. His most recent Off-Broadway appearance was as “King George III” in the hit revue SPAMILTON. Fred gained extensive national press for his dual role in MISS GULCH RETURNS!, a theatre piece for which he wrote music, lyrics, and book. He performed the show to rave reviews in New York, Los Angeles, Boston, and San Francisco, at Austin Cabaret Theatre, and on the CD, still selling and streaming after 33 years. Other Off-Broadway roles include “Top Banana” in the new burlesque revue BURLY-Q at AMAS Musical Theatre, and the male principal in THE TWO SVENGALIS opposite Drama-Desk-winner Toni DiBuono. Fred has performed as MC and Host of his numerous AMERICAN SHOWSTOPPERS concerts of classic show music, featuring the best of today’s Broadway personalities, accompanied by The Fred Barton Orchestra. Internationally, Fred co-hosted the Sydney Cabaret Convention. On TV, he appeared as himself in HBO’s CATHOUSE: THE MUSICAL, both performing songs as well as in “backstage” segments in his dual role as Musical Director. 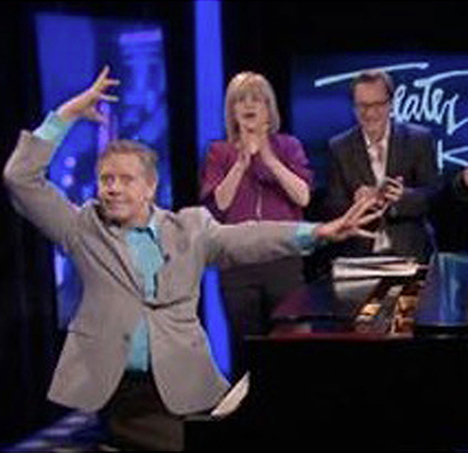 Fred has made multiple appearances on Theatre Talk, as well as his appearances on the Today Show, Good Morning NY, Entertainment Tonight,and the Merv Griffin Show. On radio, he’s guested on Sirius Radio and WNEW.